He is also known for his famous Chicken Soup for the Soul books which have sold over 90 million copies in North America alone. It is one of the most successful publishing franchises in America today. To learn more about Mark Victor Hansen, his books and training, visit his website, click HERE. 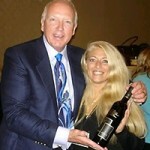 Sandra presented Mark Victor Hansen with a bottle of wine that was charged in an EESystem.